- Montreal Grand Prix Wrestling Stadium Show (July '73) = Nick Carter, Sweet William, Sweet Daddy Siki, & Bull Gregory were beaten by Dino Bravo, Dominic DeNucci, Tony Parisi, & Gino Brito. - WWC 12th Anniversary Show (September 21, '85) = The Sheepherders (Butch Miller & Luke Williams) had a "Barbed Wire" Match with Invaders I & III. The result is unknown. - NWA 1st Annual Jim Crockett Sr Memorial Tag Team Tournament Cup (April 19, '86) = The Sheepherders defeated Hector & Chavo Guerrero and the Rock-n-Roll Express, then fought to a Double Disqualification with the Fantastics. The Road Warriors won the tournament cup. - Mid-South Superdome Extravaganza (June 14, '86) = The Sheepherders lost a "New Zealand Boot Camp" Match to the UWF Tag Champs, the Fantastics. - NWA Florida Battle of the Belts III (September 1, '86) = The Sheepherders lost to the NWA United States Tag Champs, the Fabulous Ones. - NWA Great American Bash '87 (July 31) = The Sheepherders stayed the NWA Florida Tag-Team Champs, fighting to a Double Disqualification with Jimmy & Ronnie Garvin. - NWA 3rd Annual Jim Crockett Sr Memorial Tag Team Tournament Cup (April '88) = The Sheepherders beat the Cruel Connection and Tim Horner & Brad Armstrong, then fell to the Midnight Express. Lex Luger & Sting won the tournament cup. - NWA Clash of the Champions II (June 8, '88) = The Sheepherders lost to the NWA United States Tag Champs, the Fantastics. - NWA Clash of the Champions III (September 7, '88) = The Sheepherders fell to Nikita Koloff & Steve Williams. - WWC 15th Anniversary Show (September 10, '88) = The Sheepherders lost, via DQ, to the WWC Tag-Team Champs, Brad & Bart Batten. - WWF Royal Rumble '89 (January 15) = Butch competed in the Royal Rumble, which was won by Big John Studd. - WWF Wrestlemania V (April 2, '89) = The Bushwhackers (Butch & Luke) beat the Rougeaus. - WWF Saturday Night's Main Event #23 (September 21, '89) = The Bushwhackers again took down the Rougeaus. - WWF Survivor Series '89 (November 23) = The Bushwhackers, Roddy Piper, & Jimmy Snuka fought in an "Elimination" Match against "Ravishing" Rick Rude, Mr. Perfect, & the Rougeaus. Butch was eliminated by Perfect, who was the sole 'survivor'. - WWF Royal Rumble '90 (January 21) = The Bushwhackers defeated the Rougeaus. - WWF Survivor Series '90 (November 22) = The Bushwhackers, Tito Santana, & Nikolai Volkoff fought in an "Elimination" Match against Sgt. Slaughter, Boris Zuhkoff, & the Orient Express. Butch was eliminated by Slaughter. Santana was the sole 'survivor'. - WWF Royal Rumble '91 (January 19) = Butch competed in the Royal Rumble, which was won by Hulk Hogan. - WWF Saturday Night's Main Event #29 (April 15, '91) = The Bushwhackers lost to the WWF World Tag Champs, the Nasty Boys. - WWF Summerslam '91 (August 26) = The Bushwhackers were beaten by the Natural Disasters. - WWF Survivor Series '91 (November 28) = The Bushwhackers & the Rockers fought in an "Elimination" Match against the Nasty Boys & the Beverly Brothers. Butch was eliminated by Beau Beverly. Blake Beverly & the Nasty Boys 'survived'. - WWF Royal Rumble '92 (January 19) = The Bushwhackers fell to the Beverly Brothers. - WWF Wrestlemania VIII (April 5, '92) = In a dark match, the Bushwhackers beat the Beverly Brothers. - WWF Summerslam '92 (August 29) = In a dark match, the Bushwhackers & Jim Duggan defeated the Mountie & the Nasty Boys. - WWF European Rampage (April 25, '93) = The Bushwhackers took down the Beverly Brothers. 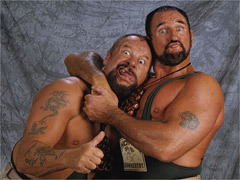 - WWC 20th Anniversary Show (August 8, '93) = The Bushwhackers beat Mr. Hughes & the Warlord. - WWF Survivor Series '93 (November 24) = Butch Doink, Luke Doink, Mo Doink, & Mabel Doink fought in an "Elimination" Match against Bam-Bam Bigelow, Bastien Booger, & Headshrinkers Fatu & Samu. Butch's entire team 'survived'. - WWF Wrestlemania X (March 20, '94) = In a dark match, the Bushwhackers were beaten by the Heavenly Bodies. - WWF Jacques Rougeau Retirement Show (October 21, '94) = The Bushwhackers won over Well Dunn. - WWF World Tag-Team Title Tournament (January '95) = The Bushwhackers lost in the first round to the Heavenly Bodies. Bob Holly & the 1-2-3 Kid won the tournament. - WWF Royal Rumble '95 (January 22) = Butch competed in the Royal Rumble, which was won by Shawn Michaels. - WWF World Tag-Team Title Tournament (February/March '96) = The Bushwhackers lost in the first round to the eventual winners, the Bodydonnas. - WWC 24th Anniversary Show (August 15, '97) = The Sheepherders fought to a No Contest in a "Barbed Wire Tornado" Match with Invaders I & II. - Amarillo 50 Years of Funk (September 11, '97) = The Bushwhackers were beaten by Mark & Chris Youngblood. - Heroes of Wrestling (October 10, '99) = The Bushwhackers took down Nikolai Volkoff & the Iron Sheik. - WWF Wrestlemania X-7 (April 1, '01) = The Bushwhackers competed in the Gimmick Battle Royal, which was won by the Iron Sheik. - Mid-South Clash of the Champions (June 15, '01) = The Bushwhackers fought to a Double Disqualification with the Moondogs.